The path through narrative begins on one side of the internal/external fence and ends on the other. Crafting effective tension from the point-of-view of your characters requires a deeper understanding of your narrative’s unique thematic structure. Some stories begin with internal sources of tension then move to the external, while others start in the external and shift back to the internal. Developing pressure is not a guessing game—if you know where to look. Our article [Generating Dramatic Tension Within Each Act of Your Story: Part Three] examines what subjective tension feels like for characters trapped in a Three-Act structure. By looking to three of Dramatica’s Static Plot Points—the Story Requirements, the Story Prerequisites, and the Story Consequences—an Author pinpoints the source of strain within a narrative. As with a Two-Act structure, the Three-Act narrative looks to the [Story Prerequisites] for the tension of the first major movement and the [Story Requirements] for the second movement. The third and final Act perceives pressure within the differential between the [Story Consequence] and the [Story Goal], with an emphasis on the former. While Two Act structures dominate most of Western narrative, the Three Act structure finishes a close second. Peter Weir’s Witness often takes center stage when exploring this brand of story, but many other examples exist. Two in particular—Curtis Hanson’s [L.A. Confidential] and Alexander Payne’s [Election]—provide an excellent illustration of tension found in similarly structured narratives. Witness generates tension for the Audience in the form of a deplorable [Situation]. Keeping the community from reacting impulsively and regressing into violence deepens that tension. Both L.A. Confidential and Election find urgency in a more familiar location: the motivation to achieve. Here, stress increases under the weight of what needs to be done and the posturing needed to engage those efforts. An interesting observation occurs when comparing these two stories. While sharing a Story Goal of [Obtaining], both films differ in regards to their respective [Story Outcomes]. L.A. Confidential’s efforts to stop police corruption Fail when the LAPD covers up Dudley Smith’s crimes. Tracy Flick’s rise to the top in both academia and politics Succeeds in Election. With [Success] in one and [Failure] in the other, one assumes a difference in structure. Dynamic story points—like Story Outcome—determine the specific nature of the Static Plot Points. The reason for the similarity? 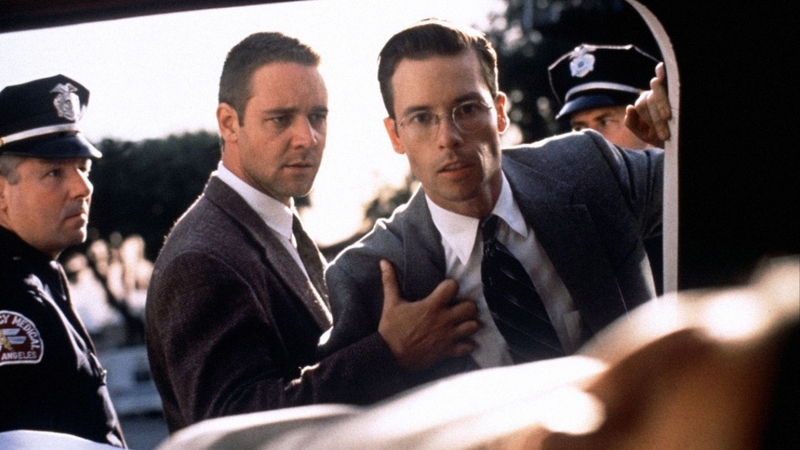 Election’s Main Character Jim McAllister (Matthew Broderick) solves problems Holistically, while L.A. Confidential’s Main Character Ed Exley (Guy Pearce) solves problems Linearly. A holistic problem-solver looks to balance as its primary directive while a linear problem-solver looks to cause and effect. Two completely different worlds of thought with similar touch points along the way—if contradiction exists with the final Outcome. Confidential looks to Doing and Being to guarantee its [Personal Triumph] the same way Election looks to Doing and Being to guarantee its [Personal Tragedy].1 The dynamic choice of [Story Outcome] may differ, but so too does the choice of [Main Character Problem-Solving Style]. One balances out the other. In the end, Dramatica assures the integrity of the artist’s thematic statement by setting these key story points to align with the message. Central Dramatic Tension: Will Bud and Exley stop corruption within the Los Angeles Police Department? Act One Dramatic Tension: Will Exley and Bud be able to get along as partners? Act Two Dramatic Tension: Will Exley and Bud track down the officers behind the Night Owl Murders? Act Three Dramatic Tension: Will Exley and Bud be killed? When looking to introduce tension into a narrative, one presumes characters facing certain death to be a common occurrence. However, examine a film like [Star Wars] and notice the lack of focus on Luke dying. Instead, the narrative focuses on whether the Rebels will be able to complete their mission—not on the negative potential for dying. Same with Eastwood’s [Unforgiven]. That film explores life or death stakes at the end, but the concern is not over Munny dying—the concern is coming to terms with your true nature. Contrast these two examples against L.A. Confidential where the concern is absolutely focused on who will live and who will die. With Ed and Bud completely surrounded by corrupt cops, the tension within the narrative grows over the subjective concern of Will we make it through the night? Will we die right here and right now? These life and death stakes found in a Story Consequence of Becoming only exist in Three Act Structures. Consider Unforgiven and [The Matrix]—both narratives that share a Story Consequence of Becoming, yet share a Two Act Structure. That Third Act, the one that maintains tension through the Consequence, fails to appear in these stories. Generating tension with the prospect of Munny or Neo dying is a nonstarter. Combine a Three Act structure with a Story Consequence of Becoming—or Changing One’s Nature (death is a change in nature)—and it appears as if structure dictates content. That final Act must feature life or death consequences. Or, at the very least, the transformation towards our primal natures. Central Dramatic Question: Will Tracy achieve success? Act One Dramatic Tension: Will Tracy and Jim be able to maintain their roles as student and teacher, respectively? Act Two Dramatic Tension: Will Tracy and Jim be able to do to the other person what has been done to them? Act Three Dramatic Tension: Will Jim and Tracy be able to maintain their essential natures and not devolve into ruthless neanderthals? Sadly for Jim, the answer to the last question is no, evidenced by the final scene comparing him to a caveman. For Tracy, the answer is yes as she avoids any Consequences on her way to the top. In a Personal Tragedy, the Protagonists efforts end in Success while the Main Character fails to resolve their personal issues. Election clearly [splits the function of Protagonist from the perspective of the Main Character] in order to tell its story. With Tracy as the primary driver for resolution in the plot, it makes more sense to place her at the center of dramatic tension. Jim feels tension, but the source of that tension comes from her relentless pursuit for success. L.A. Confidential and Election shine as examples of tension built up while engaging in problematic activities. Characters move from the internal—Being, or playing roles—to the external—Doing—on their way to greater physical accomplishment. Characters that find resolution in changing the way they think move in a different direction. Central Dramatic Question: Will Jack be a good man in time for his wedding? Act One Dramatic Tension: *Will Jack get enough “tail” before his wedding day? Act Two Dramatic Tension: Will Jack burn the womanizing out of his system in time for his nuptials? Act Three Dramatic Tension: Will Jack stop sleeping with other women? Unfortunately for Jack’s wife, the answer is no. Unlike many of the examples in this series on [Plotting Your Story With Dramatica], Sideways ends in Failure. The tension bred by the Consequence wins out. By Doing what he has always done, Jack fails to reach the Story Goal of Being a Good Man and suffers the Consequences. Note the difference in plot points: In seeking physical resolution, L.A. Confidential moves from internal to external. In seeking mental resolution, Sideways moves from external to internal. Different problems, different paths to resolution. The Static Plot Points of Dramatica guarantee consistency of thematic intent while maintaining the integrity of narrative structure. Dramatic tension is not random and it is not happenstance. It flows naturally from the combination of story points carefully laid out to deliver a message of purpose—or Author’s Intent—to an Audience. The Dramatica theory of story makes aimless speculation a thing of the past. By flipping switches and dialing in thematic strength, an Author primes the story engine with his or her own artistic purpose. [The storyform] that arrives upon completion of this process supplies the writer with ample insight into the unique set of story points needed to complete and accurately broadcast their message. With Dramatica the Author simply dreams, then writes—knowing their efforts sync harmoniously with their original intent.